“ReFit” is a bone graft substitutes made of hydroxyapatite and collagen composite. ReFit becomes elastic when hydrated. As a result, it can be packed or placed to bony voids without leaving any gaps. It can be easily processed with a scalpel or scissors. Structure and composition was approximated to human bone up to nano-level. ReFit is incorporated to the bone remodeling cycle after implantation to be replaced to bone tissues. ReFit is confirmed to be superior in bone regeneration by clinical trial. ※Compared with the similar products when filled in bone defects caused by bone disease like bone tumor, trauma or after harvesting autograft. 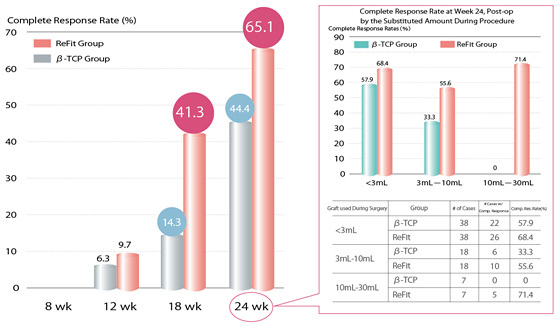 Clinical trial of ReFit was conducted in accordance to “Guidelines for clinical test for medical devices (Medical device GCP)” Comparative study was performed using a mormal β-tricalcium phosphate as a control device for absorbable bone graft. ・Allergic subjects with medical history of anaphylaxis, severe allergic subjects, or patients with allergy against drugs containing porcine collagen.